It's dark out now, and the narrow, dirty streets of Varanasi are crowded with revelers blaring music so loudly we hear it straight through our barely-there hotel walls. I roll over in bed, sift through my backpack in search of earplugs, and stuff them in my ears. I'd love to block out the sounds of chaos down below—it's been a long day to arrive here at the Haifa Hotel in Varanasi's city center, and I'm craving quiet rest after a long train journey. After traveling for two months in India, I've learned that when there is peace for a moment, it seems like the whole world folds into me and I can recharge again—slowly, my exhaustion from the madness of India disappears. But alas, from the sound of things outside, tonight will not be one of those peaceful, recharge kind of nights. Tonight, we are soon to discover, is a festival night and it sounds like this party is going all night long. If you can't beat them, join them. Isn't that the saying? We begrudgingly change out of our pajamas and head downstairs to join the partiers. Outside, men with decorated art cars, which remind me of Burning Man, blare music and strobe lights powered by a second cart pulling a generator for electricity. Men dance wildly in the makeshift parade, blowing fire, blasting fireworks. It's an all out celebration for the Hindu goddess, Saraswati. At some point though, I realize something strange about this street party: there are no women. I never do find out why this is so. I'm the ignorant Westerner, and the odd lady out here. We continue on with the revelers until some hours later, the party ends and we turn in for sleep at last. We are convinced that our stay in Varanasi is going to be crazy. I've heard that Varanasi can be tough for tourists, especially at night with crime and pickpocketers, so we are cautious while exploring the city the next morning. The streets are so narrow here, and plenty filthy and crowded like any good Indian city. It's most likely impossible to have any sort of relaxing stroll here given the constant stimulus and necessity to dodge things that might accidentally try to kill you. The narrow alleyways and streets are cram packed with cars, rickshaws, cows, goats, hawkers, beggars, and of course, colors. So many brilliant colors. As if the regular chaos of Varanasi isn't enough, the world's largest gathering of religious pilgrims with over 100 million people, the Kumbha Mela, has ended in Allahabad, and many of the sadhus and babas, or holy people, have migrated to the Ganges here in Varanasi. The city feels like it's bursting at the seams with hundreds of tents lining the riverside. They too are all men. Many of the sadhus are completely naked with white ash rubbed all over their body. Others wear orange clothes, and layers and layers of beaded necklaces. I see contradictions. These holy ascetics are supposed to have denounced all worldly things, yet one by one I see them with cell phones. I see one man watching a DVD on a laptop. I see one naked sadhu photographing the burning funereal ghats, which even as a Westerner, I understand to be disrespectful. We live in a hypocritical world my friends, where belief in a religion is oftentimes perceived as a "free pass" for doing things we say we shouldn't do. My hair smells of smoke, my foot is tired, and I'm ready to go back to the haven of our hotel. We have spent a long day walking along the ghats, battling traffic, and then trying to make our return back to the hotel through narrow alleyways of dirt and small nooks with hidden shops. But more than exhaustion, I am bogged down my feelings of confusion and despair about poverty, once again. I return to something I believe has to be an ethical dilemma faced by any compassionate Westerner who spends enough time in India: confusion about poverty, privilege, and when to give or take. This topic is heavy, and feels even more challenging in the north of the country. Here, Indians give us visitors services that we continually don't ask for—don't want even—yet we are then forced to accept. In turn, they expect to be paid. The question that I keep turning over and over again in my mind is of course: do you pay them? Even as this repeats constantly, over and over again? It's the woman holding the bathroom door open or the man cleaning the hotel room who insists on carry my bag and dozens more. All of these people repeatedly force their unwanted services on us because we are Westerners, but how should we react once they've performed their duty despite our insistence not to do so? Is there an obligation to pay them? This makes me frustrated, uncomfortable, and hardened. 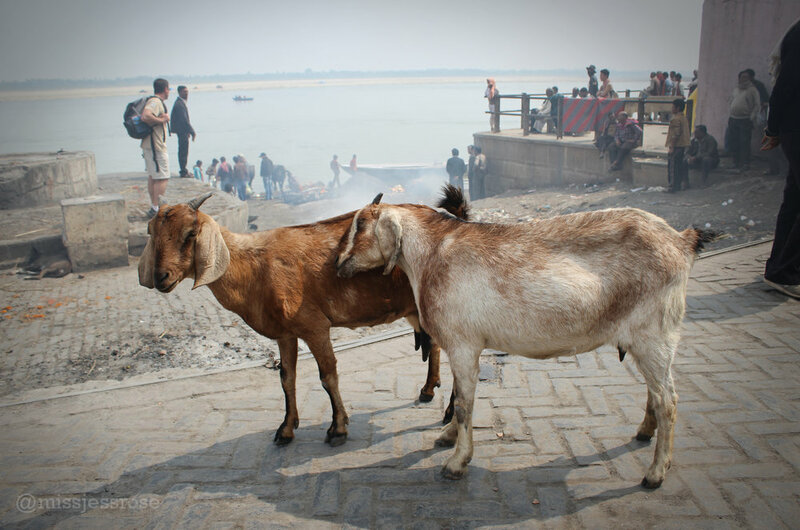 The next day, I'm watching a body burn at one of the ghats along the Ganges. It's a powerful sight, to see and smell flesh burn. In my country, we would never watch one of our loved ones physical bodies transform from this earth in this way. Our cremation process is hidden from sight. Here, the family watches on. It feels strange to me, something I am unaccustomed to. As the three of us stand quietly watching, a self-proclaimed "Brahman priest" approaches us, chattering away. It's clear that he wants money, and being friendly Americans, we are suckers in that we politely listen. I wonder if this could be categorized as harassment, as eventually, we do ask him to leave. But he follows us, chattering away, even though we try to ditch him. Dead bodies wrapped in shimmering gold cloth process past us on bamboo racks to the sacred wooden piles next to the river. This man keeps on chattering. We watch as a new funereal pyre is prepared. Long grasses are stuffed beneath the wood pile and body until everything catches the blaze. Smoke billows wildly. There are now about 30 bodies burning directly below me. I have never seen anything like this. The priest, or clever Indian actor for all we know, still hasn't left our side after about a half hour of observation. He is playing the long game. His pitch is that he needs money to help the dying poor who need to buy wood for their death pyre here, but can't afford it. Would we mind just giving some rupees for this cause? This man is one of many today who see us as a walking target of money distribution. How can one maintain compassion when, every second, every person in Varanasi seems to want me for only one thing: money? How can I really contribute to helping real people in need? How does one discern between a scam and what is true? This is the thing in India—everybody wants a piece of you here. It is painful. People can be so bewilderingly generous and friendly, but now I also carry a shadow of skepticism about their legitimacy that's hard to shake off. People see us as targets, goldmines to plunder. They pounce on us with greed. And each time this happens, I question myself. Have I given enough today? Does this person deserve more? Can I afford to give, and will it really make things better? These are questions that are easier to hide from back home. In may regions of the U.S., we escape poverty even though it's there just the same. People at home who I know shield their eyes, blind themselves from the fact that we are spoiled and lucky and that millions are struggling to survive. But here in India, it chips away at my heart strings, pulls me towards sadness. Days later, a new Indian friend gives us advice about being an obvious Westerner in India. Indians are masters at professionally pulling at your heartstrings, he says. Don't fall for it.